Sathiguru Arjun Dev Jee begins the shabad today, hamaree ganath n ganeeaa kaaee. Waheguru Jee has not ganeeaa, Waheguru Jee has not tallied up, has not counted up, has not taken into account kaaee - at all, my ganath. Ganath means the action of all of the deeds and misdeeds, the good things and the bad things, the account of all of these things done by me, Waheguru Jee has not looked into these, Waheguru Jee has not weighed out my good and bads. Apanaa biradh pashhaan. Instead, Waheguru Jee has pashhaan, has carried out and fulfilled His biradh, His nature. Gurmukh piaareyo, in Sikhi, this is the nature of God. The nature of God is not to take into account. When Waheguru Jee is going to bless someone, Waheguru Jee can bless the prostitute Ganika. If she starts repeating The Name of Raam Naam, The Name of God, then even she is saved. Sri Guru Nanak Dev Jee went out and saved the cannibal Kauda. We see countless other examples of this in Gurbani and in the Gur itihaas, in the history of The Gurus. Gurmukh piaareyo, this should be the ardas of the servant as well. This should be the supplication of the servant, of The Sikh, of the spiritual being. We should not be demanding that we get what we deserve because the true servant realises that ham avagun bharae eaek gun naahee. That I am bharae, that I am overflowing with avagun, that I'm overflowing with vices. Eaek gun naahee, that I do not even have one virtue. That is the state of being, that is the state of mind of a true Sikh, of a true servant, of someone truly following the path. A small story that is found in Soofi literature associated with this is that there was once a soofi fakir, a holy man and he was sitting upon a rock. He sat upon this rock for 12 years, and every day in his heart he thought I am sitting here deep in meditation upon this rock. God, give me adal. Adal means give me what I deserve, give me the fruit of my labours. One day a poor shepherd was walking by and he saw this fakir sitting upon the rock, he was inspired to meditate. Even though he was just a poor shepherd, all his life he would walk around meditating upon God, chant God's Name, get up every morning and meditate upon God. In his mind he always had this thought, O God, bless me with fazal. Fazal means with Your grace, with Your blessings. I am not worthy of anything. Look at this man who is sitting here for so long upon this rock. He has been sitting there, he has devoted his life, what am I doing? What have I done? According to the story, the day came when both of them died. On one side there was the fakir. The fakir stood in the court of God and he said, O God, I demand adal, I want adal, I want to have the fruit of my labours, I want to have what I deserve. Suddenly a second voice came out of nowhere and said I want adal too. When they looked around, the second voice was of the rock. The rock said, O Lord God, this man has sat upon me for 12 years, if he wants what he deserves, if he wants the fruit of his labours, then I should get to sit upon him now for 12 years. And so it was granted, adal, what he deserved. On the other hand, there was this poor shepherd. This poor shepherd stood there and said O God, I am worth nothing, I have no labours, I have nothing which I can say I am proud of, I fall at your feet and ask for fazal, for your blessings. God smiled and laughed, He said if you want fazal, if you want my blessings, you are liberated, you are enlightened. Gurmukh piaareyo, although the story is out of Gur itihaas, out of Sikh history, still this story gives us a great insight into this tukk of Sri Guru Arjun Dev Jee Maharaj. O Sikh of The Guru, always have the words of Guru Arjun Dev Jee in your heart at all times. Jap thap sanjam dharam n kamaaeiaa ll Saevaa saadh n jaaniaa har raaeiaa ll I have not practiced, and I am not able to practice any meditations, any austerities. I cannot with my own strength perform your saevaa, perform your selfless service. Kehu naanak ham neech karanmaa ll Saran parae kee raakhehu saramaa. I have lowly actions, and all I can say is I fall at Your feet, into Your saramaa, into Your protection. This is the birtee, this is the nature that Guru ka Sikh should have in his or her heart. If you have this nature in your heart then what happens? Guru Arjun Dev Jee says that apanaa biradhh pashhaan. God recognises his own nature, because God's nature is bhagath vashal. Bhagath vashal means the protector of his devotees. God's nature is that He is pathith oudhaaran. Gurbani tells us again and again - bhagath vashal anaatheh naathae. On the other side we hear, pathith oudhaaran sathigur maeraa. Pathith oudhaaran means that He oudhaaran, he liberates, that He emancipates those who are pathith, those who are fallen off the path. Even them, God can save. Waheguru Jee gives His own hand, haathh dhaee, raakhae - and protects His beloved ones. Kar apunae, He makes us His own. Those people who are made god's own, sadhaa sadhaa ra(n)g maan, forever and ever they enjoy the colour of God's a(n)g, God's love, of divine love. What does this mean? Kar apunae. This means that those humble beings who meditate upon God's Name, they become God's own. If we read Bhagat Ravi Das Jee's tukkaan from Sri Guru Granth Sahib Jee, Bhagat Ravi Das Jee laughs at those people who claim to be chosen because of their caste or their ancestry. Bhagat Ravi Das Jee says in a loud clear voice, aapan baapai naahee kisee ko bhaavan ko har raajaa on Ang 658 of Sri Guru Granth Sahib Jee. The Lord, our King is father to no one except those who love Him. Those who love The Lord become His own. Haath dhaee raakhae kar apunae. Waheguru Jee has made us His own, haath dhaee, protecting us with His own hand. If we ask, why does Guru Jee protect His beloved with His own hand? The same question was asked by a king to a holy man. According to the story, the king said, whenever there is a problem in the country, I send my army or I send one of my generals. I rarely go myself. Why is it that you say God Himself protects His devotees? The holy man said you will get your answer in a few days. What then happened was that the king was walking around in his gardens. There was a pond in the garden of the king, and by that pond the holy man had made a little statue of the king's son. The statue looked exactly like the king's son. He had a string attached to the statue and he was hiding in the bushes. When the king came towards the statue, the holy man pulled the string and the statue fell into the pond. The king didn't look left or right. He jumped straight into the pond. When he saw that statue fall, he thought it was his son and he jumped straight in. He pulled out the statue and when he realised it was a statue and he looked up, he saw the holy man there laughing. He asked why are you laughing? The holy man said this is the answer to your question. The king said I don't understand. The holy man said, you had your bodyguards around you, you had your soldiers around you, you had your officials around you, why didn't you send any of them to jump in? The king said because I thought this was my own son, I thought this was my apanaa. The holy man laughed and said that's the same for God. 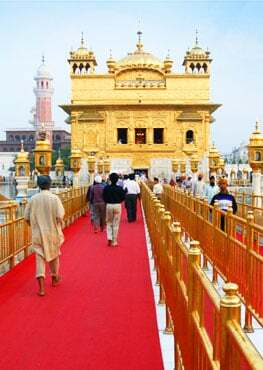 Those devotees who are the sons of God, those devotees who are the daughters of God, those devotees who love God; Waheguru Jee protects them with His own hands. My true Lord Master Akal Purakh Waheguru, sadh, is forever miharavaan. He is forever merciful. My poorai, my perfect Sathiguru, my eternal Guru has ba(n)dhh paaeiaa. Ba(n)dhh has been translated again in many ways. Ba(n)dhh can mean rok, which means to stop. Through uniting me with The perfect Guru, He has stopped me from engaging in any evil actions. He has put that stop there, ba(n)dhh paaeiaa. I cannot do any bad actions now because The Guru has stopped me. The Guru has given me the ba(n)dhh, The Guru has given me the regulation of His rehat which stops me from going on the evil path. Ba(n)dhh paaeiaa is also translated by sampardaayak scholars to mean santokh. The Guru has blessed me with santokh, with contentment. He has ba(n)dhh , he has bound down all of my desires and he has given me contentment. Hoee sarab kaliaan. When The Guru, when Waheguru, when God blessed me with this, hoee sarab kaliaan. I achieved sarab - all, kaliaan - all aversions of liberation. I was completely liberated. This means in no way, shape or form am I bound down anymore by the shackles of life and death. I am completely liberated. Rehaao - pause and think about this Guru Jee says. Jeeo paae, Waheguru Jee is The One Who has put the soul into you. Pind jin saajiaa He has made this pind, this body. Dhithaa painan khaan. 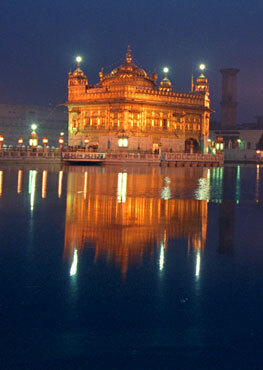 Waheguru is The One Who has given you painan khaan, everything to painan - wear, and to khaan - eat. That Waheguru Who has made your soul, That Waheguru Who has made your body, That Waheguru Who has given you food and clothes, apanane dhaas kee aap paij raakhee. Waheguru Himself protects the paij, the honour of His servants. Naanak sadh kurabaan. Sri Guru Arjun Dev Jee says sadh, forever and ever, I am kurabaan, I am a sacrifice to The Lord God Waheguru Who Himself protects His servants.